With the holidays coming up, I have been thinking about what desserts we had when I was a kid. My Grandma used to make this cake for Christmas and I thought it was so fancy and grown up. I couldn’t wait until the cake was cooled to eat. Since Grandma isn’t here to ask her for the recipe, I had to do some testing of recipes and I think this recipe is very close. After trying the first piece I could remember Grandma and Grandpa’s fun Luau parties with all of the guests ending up in the pool. They loved having parties with great food and lots to drink and always wonderful desserts.The trick for this cake is glazing it while it is hot out of the oven. The recipe for the glaze seemed like a lot to me so I halved it for my cake but you can use all of the glaze, it is your preference. 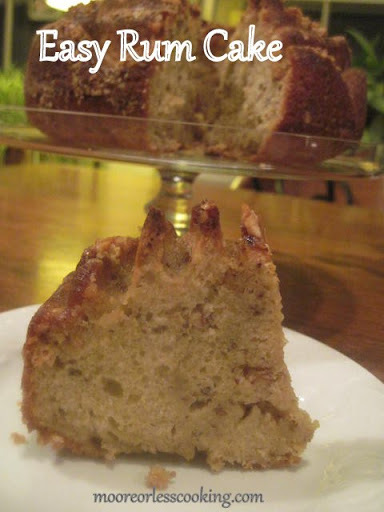 I also chose to use walnuts for this cake and it really is a great combo with the vanilla and rum flavors. I used the cake mix with vanilla pudding in it and I also added another vanilla pudding. I know…really wild stuff for a Friday Night! Grandma and Grandpa would think I was a real dud! Grease and flour 10-inch tube or 12-cup Bundt pan. Cool; invert onto serving plate. Prick top with fork. Spoon and brush glaze evenly over top and sides. Boil for 5 minutes, stirring constantly, and remove from heat. Stir in rum. You may decorate with whipped cream before serving. I have made this and the people raved about it,Some have asked for it again and again. I make rum cake all the time. The more of the glaze you can get the cake to soak up the better the cake will be. I used dark bacardi rum instead of spiced rum too. 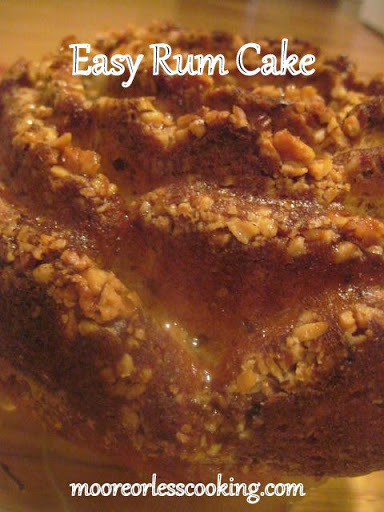 Very much the famous Bacardi Rum cake which I have baked over 40 years. Anyhow I use cream of coconut pudding & Malibu Coconut Rum Yum! However the half cup rum in the glaze makes it really strong so I have cut it to 1/4 cup. I just made one using 1/3 cup & it was still too strong! I used to make them for my post office folks & they told me they’d each get straws & drink the glaze out of the open center:) Too funny!